Follow along our farm adventures and production season. Meet Claire Charny, the newest member of Red's Quality Acre and our first ever full-time employee! She's an old Chicago friend of ours who spent 2-seasons working alongside Dave at City Farm Chicago. Before coming down to Durham this spring, Claire was the production manager at Field & Florist— a Chicago-based flower farmer and florist specializing in local and sustainably grown florals for weddings and events. Claire has begun experimenting with flowers at the farm and as she expands our production she's also developing her own potential floral business endeavors. Meet Caitlin, Red's rookie farmer. She's worked hard in the past year learning about all aspects of working a farm and running her own business. Caitlin has a sharp attention to detail and keeps us organized. These are great assets for farming and without these skills Red's would not run so smoothly. Norm puts the 'acre' in Red's Quality Acre; he so graciously provides the land that we grow all of our produce on! Beyond being deeply generous and having amazing soil Norm is a retired teacher, birder and origami master. Norm brings a scientific eye to our operation. What a difference a week makes! Last week on the blog we discussed how excited we were to get started with the winter squash harvest. Yesterday we finally got to it and spent all morning picking spaghetti, acorn, and butternut squashes. The delicata will stay in the ground until they are a bit more ripe; in the meantime we'll pick here and there for the CSA and whole sale accounts. The greenhouse has now transformed into the winter squash curing site for the next 10 days or so. This process allows excess water to exit the fruit and prevents rotting, while enhancing long term storage rates. In addition, curing concentrates the natural sugars giving the squash a bit sweeter taste. We cure our winter squash first so we can store them in our walk-in cooler for up to 6 months depending on the variety. This extends our wholesale income while also supplying us delicious food through the fall and into the winter. As mentioned in a previous post, we were lucky enough to gain a little more land to grow on this season. The small plot is located just down the road and has been the exclusive site for our melons and winter squash. Initially, we had some trouble with irrigation and a bit more trouble with deer getting in and snacking on the plants. Despite these set back's we're happy to announce the crops have not only survived, but thrived! In the next few days or so we'll go through and harvest all of the winter squash varieties which include butternut, acorn, delicata, and spaghetti. This will be our first time growing some of these varieties and we're so excited to share them with everyone! We're excited to share a recent video taken of Red's Quality Acre. A dear friend of ours came down to the farm, by way of Chicago, to shoot a quick video using his new drone. Click the picture above to watch this fun bird's-eye view of the land and a little behind the scenes look at our day-to-day. We really enjoyed seeing the whole farm from above and hope you do, too. If you ask us, the best part of summer is eating garden fresh tomatoes; nothing compares to the taste! Whether you enjoy your tomatoes simply sliced with a dash of salt, on toast with some mayo, atop a sandwich or in your famous sauce we know you don't really need instructions for eating a tomato. That being said we just thought we'd share this extremely easy and very satisfying recipe our friends shared with us upon their trip from Spain. It is a flavorful tapas dish that can be completed in under 15 minutes. You can also have folks rub garlic on the bread themselves and turn in into an interactive dish. Just be careful it's addicting! 1. Split tomatoes in half horizontally. Place a box grater into a large bowl. Rub the cut faces of the tomatoes over the large holes of the box grater, using the flattened palm of your hand to move the tomatoes back and forth. The flesh should be grated off, while the skin remains intact in your hand. Discard the skin and season the tomato pulp with kosher salt to taste. 2. Adjust rack to 4 inches below broiler and preheat broiler to high. Place bread, cut side up, on a cutting board and drizzle with olive oil. Season with kosher salt. Place bread, cut side up, on a rack set in a tray or directly on the broiler rack and broil until crisp and starting to char around the edges, 2 to 3 minutes. 3.Remove bread from oven and rub with the split garlic cloves. Spoon tomato mixture over bread. Drizzle with more extra-virgin olive oil and season with flaky sea salt. Serve immediately. Over the past few weeks we've been working toward expanding our wholesale reach through partnerships with local restaurants. Most recently, we began selling to Gocciolina Italian Restaurant in Durham and Vimala's Curryblossom Cafe in Chapel Hill. We are so excited to develop these new relationships and thrilled to see our produce incorporated in a variety of delicious Italian and Indian dishes. Gocciolina: an Italian restaurant located in North Durham, where you are sure to find good food and good times and wines to go with it. Vimala's Curryblossom Cafe: Vimala Rajendran grew up in Bombay where she learned to cook from family, street vendors & friends. In 1994, a single mother of three, Vimala started cooking donation-based community dinners in her Chapel Hill home. Sixteen years later in June 2010, thanks to the support of our beloved community, Vimala’s Curryblossom Cafe was born! They have a strong value in community by engaging intentionally in the farm to fork process and living their vision of creative resiliency. "Diggin' My Potatoes. . ."
This week, with the help of our dear friends from Chicago, we completed our annual potato harvest. We are excited to say we hauled in about 400 pounds of potatoes! This year we grew three potato varieties-- red skin, yukon gold, and purple majestic. Luckily these guys store in our walk-in cooler for up to three months so we hope to utilize for several weeks in the CSA and sell them wholesale as variety narrows in the summer. We know you're busy and encourage you to commit time that best fits your schedule. Let us know and we'll try to accommodate your availability. Please feel free to pass this along to friends, family, neighbors, etc. If you or someone you know is interested email us at info@redsqualityacre.com. You read that correctly... summer is just around the corner! 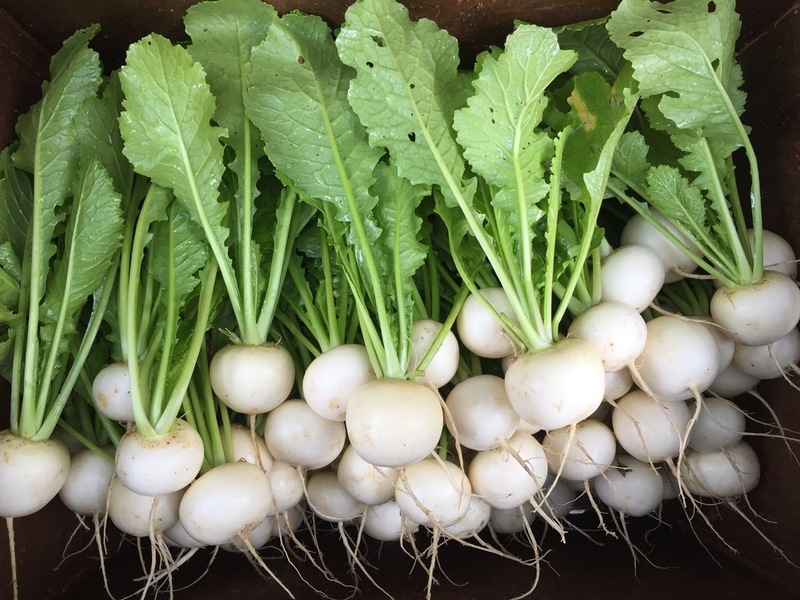 In the next couple of week's we will be transitioning from spring to summer crops. Although our summer crops have been seeded and/or planted for weeks, they are just starting to make their debut. This week you'll notice some new produce items, but there's even more in store like 7 tomato varieties, eggplant, sweet and hot peppers, beans, squash, and new herbs! We are excited to announce we will be expanding our growing space for the 2016 season! Thanks to the generosity of one of our neighbors we have acquired approximately a 1/4 acre of more growing space. The new site is conveniently located down the street and will provide us with room to supplement our crop plan. In the next week or so we'll be planting melons and winter squash with additional crop plantings to follow. As always, we will continue to utilize only sustainable growing practices on the new land! ‣ Weaver Street Market Hillsborough: a vibrant, sustainable food marketplace defined by shared economics, shared community, and shared knowledge for owners and potential owners. ‣ Durham CoOp Market: a community owned and community focused market with a goal to return as much revenue as possible to their community by supporting local farms, selling locally made products, and supporting local jobs. ‣ Scratch: makes real, honest, hand-crafted food. They support and nurture relationships with local farmers and producers and are proud to be a part of Durham, North Carolina’s growing, vibrant food community. ‣ NOSH: one of Raleigh-Durham’s premier spots to enjoy eclectic comfort cuisine within a welcoming, energetic environment, attracting a wide range of guests, including students grabbing breakfast, colleagues holding lunch meetings and families enjoying dinner on the spacious outdoor patio. ‣ Funny Girl Farm Stand: committed to growing the best fruits and vegetables possible in a way that nourishes and preserves our environment. We are thrilled to have the support of our CSA members for Red's 2016 growing season. Throughout the winter and early spring we have been diligently planning, seeding, transplanting, and weeding in anticipation for CSA season! Without the CSA contributions and membership none of this would be possible! The money spent on CSA shares provided us the essential resources to purchase seeds, potting soil, irrigation, soil amendments, packaging, and tools as well as helped us repair and expand our infrastructure! So a big THANK YOU to all of our CSA members for taking a chance on us and supporting local small-scale farming. There will be a variety of seasonal veggies and herbs over the next 24 weeks that we can't wait to share with our CSA. Check back for updates on how the CSA is going and what members are getting each week! First things first— we must thank each and every one of you for your ongoing support throughout this journey! We certainly could not have pulled this off without your help both near and far. From your business advice to marketing support, pump up phone calls to mailing us encouraging farming articles. Whether you fed us, provided free labor, or just liked one of our Instagram photos you truly contributed to our successful first year as farm owners. For that we are forever grateful! So thanks again for believing in a couple'a redheads; your support transformed our dream life into a reality! We were excited and somewhat surprised when reviewing our numbers at the end of the year. You never quite know how well things will do in your planning phase and it can be a challenge to grasp how things are going when you're in the thick of it. For example, in years past tomatoes did not grow well at our land making it quite the surprise to see tomatoes were our most prolific crop! Additionally, other crops Dave had great success selling in Chicago were not as profitable here in Durham. We are keeping these experiences, our CSA feedback, and sales records in mind to develop a leaner and more efficient crop plan for the 2016 growing season. Collaboration and community building are essential components to the Red's mission. As we developed our business we sought out local businesses that shared our values. Fortunately, the local food community is extremely accessible, supportive, and collaborative-- making it a pleasure to build relationships while developing our business. This year we were lucky enough to work extensively with LoMo Market, Weaver Street Market, Durham Co-Op Market, Scratch Baking,and NOSH. Rafi Grant: we have submitted our proposal for funds to purchase a Pack N' Cool mobile cooler to expand our refrigeration capacity. Staff Development: our first employee Adam will be increasing his time at the farm— joining us three days a week in 2016! Growing contracts: with the help of our partners we have developed growing contracts to increase the efficiency of our crop plan as well as expand wholesale profits. New Hoop House: we completed construction on our hoop house in the late fall allowing us to grow lettuces through the winter. We are excited to continue and further develop our season extension throughout the year. Thank you again for all of your support. Here's to a bountiful 2016! How long have you been in agriculture? I started gardening with my dad growing up. To call it agriculture, it's been 10 years. Peanuts because they are so interesting. Edamame (but I can't eat them on my current diet), tomatoes, and cone cabbage. The heat, this year and every year...it's always the heat. Greatest accomplishment at Red's so far? Working with Dave and Caitlin to be honest. Helping them getting things set up and seeing it work has been my greatest accomplishment. When you're not farming, what you can be found doing? Meet Dave Henderson our co-founder and fearless leader! A Durham native, when Dave decided to start his own operation he knew there was no better place to root himself than Durham, NC! (pun intended!) Here's a little more in-depth look at the mastermind behind Red's. The transition from working on a farm with a collaborative and efficient team to running my own farm and taking on several roles myself. It's been hard wearing so many different hats. Being really happy with the produce we're growing and the genuine support from our CSA members, wholesale vendors, and other local farmers. Playing music with my friends, skateboarding, eating 4-5 meals a day and attempting to sleep. It was a beautiful spring day last week, redbuds were blooming, and I was weeding our potato patch. The henbit and chickweed were making a run for it, trying to spread into the potato beds. Though the potato plants themselves are vigorous, there’s no sense letting those weeds crowd them and steal the nutrients we have worked so hard to get incorporated into the soil. So there I was, with my trusty hoe, scratching the soil. As the sun climbed higher in the sky, the heat and humidity were building. I had been at it awhile, and my shoulder hurt and my back was starting to ache. Age takes its toll. I was nearing the end of the first hundred-foot row, when I stood up to arch my back and then lean on my hoe for bit. And there they were, a pair of Chipping Sparrows, pecking in the dirt just a few feet away. I stood there quietly as they went about their business, searching for weed seeds in the broken earth. They seemed oblivious to my presence, so soon I went back to my job. And there we were, working side by side. I was killing weeds; they were eating seeds that would otherwise become future weeds. A delightful partnership. A cloud passed in front of the sun, and a slight breeze cooled my skin. My toil seemed a lot less toilsome. My aches seemed a lot less achy. And life was good. At Red’s Quality Acre, we know that quality soil is essential to growing quality crops. It is possible to grow large tomatoes and bright green kale using synthetic fertilizers and chemical pesticides. But that is not the Red’s Way. Synthetic fertilizers wash out of the soil quickly, leaving the plants needing more and potentially polluting our streams and rivers. Chemical pesticides don’t just poison pests, they can also poison the organisms in the soil—oh, and by the way, perhaps people. That is NOT the Red’s Way. In our part of North Carolina, red clay is a very common soil type. Many people scorn the clay, but it actually has some very good characteristics for farmers if treated with respect and nurtured appropriately. One of clay's finest qualities is that it can hold moisture. A heavily mulched clay soil with lots of organic material mixed in can help farmers get through periods of drought with much less irrigation. And the clay can hold the nutrients plants need as well. So the question is, how can we nurture the clay to enhance its benefits. Crimson clover is planted in the fall so that it germinates and grows all winter long in our relatively mild climate. It forms a mat over the soil that crowds out weeds that might otherwise grow. It holds the soil so that heavy winter rains don’t wash it away. In the spring, when it is plowed in, the soil gets a nice dose of organic matter. And being a legume (like peas, beans, and peanuts), it hosts one of a farmer’s best friends known as nitrifying bacteria. Nitrogen is essential for plant growth. Plants must have it to make proteins, DNA, and other chemicals. Fortunately, air has lots of nitrogen. Unfortunately, that nitrogen is in a form that is not useful for plants. Atmospheric nitrogen has to be converted into nitrates. Plants can’t do it themselves, but nitrifying bacteria can. Plants like clover have evolved the ability to house nitrifying bacteria in little nodules in their roots. (Note the reddish color of the nodules in the photos below. The bacteria make a chemical similar to hemoglobin in human blood.) The bacteria get protected places to live, bathed in nutrients that make life quite nice for them. The clover plants get to use the nitrates made by the bacteria. Strange, but wonderful bedfellows. In the spring, when the clover is tilled back into the soil, the quality of Red's Quality Acre becomes a little bit richer. The organic material of the clover and a lot of that nitrogen nurture the soil and the crops to follow. So the next time you find a four-leaf clover, perhaps it will bring you luck. But all those three-leaf clovers are providing housing for millions of bacteria that are helping to build and nurture healthy soil for all of us. That is Red’s Way.